You can set up a default printer that will be used every time you print so that you don’t have to select a printer each time you need to print something from your computer. In this case, your printer is the hardware. 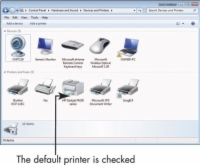 In the resulting Devices and Printers window, the current default printer is indicated by a check mark. 3Right-click any printer that isn’t set as the default and choose Set as Default Printer from the shortcut menu. This sets your printer as the default. 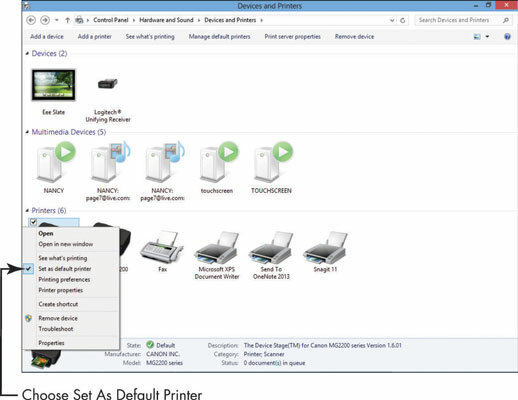 4Click the Close button in the Devices and Printers window to save the new settings. To modify printing properties that are available for your particular printer model (for example, whether the printer prints in draft or high-quality mode, or whether it uses color or only black and white), right-click a printer in the Devices and Printers window and choose Printing Preferences. This same dialog box is available from most common Windows-based software programs, such as Microsoft Word or Excel, by selecting the Print command and then clicking the Properties button in the Print dialog box. 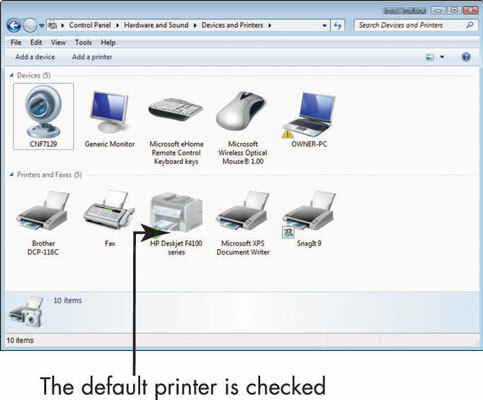 If you right-click the printer that is already set as the default, you’ll find that the Set as Default Printer command will not be available on the shortcut menu mentioned in Step 3.